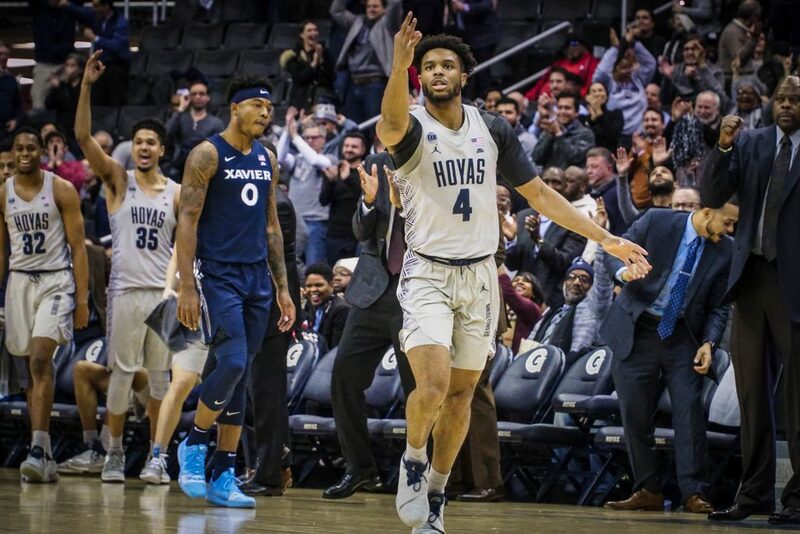 The Georgetown men’s basketball team (14-7, 4-4 Big East) recovered from a slow start and put together a huge second half performance to take an 80-73 win over Xavier (11-11, 3-6 Big East) on Thursday night at Capital One Arena. With the win, the Hoyas move to .500 in conference play and take sole possession of third place in the Big East. Freshman guard James Akinjo led all scorers with 23 points – all in the second half – to go with four assists, five rebounds, and a career-high five steals. Senior center Jessie Govan, freshman forward Josh LeBlanc, and freshman guard Mac McClung were all major factors as well, each notching double-digit scoring on the night. The Hoyas got off to a slow start on offense and failed to score for the first four minutes. The Musketeers took advantage, jumping out to a 9-0 lead, and head coach Patrick Ewing was forced to call a timeout. After the game, freshman forward Josh LeBlanc spoke about the early struggles. LeBlanc temporarily put a stop to the bleeding with back-to-back buckets, but Xavier responded and was soon up 12-6 after a midrange jumper from junior forward Tyrique Jones. LeBlanc again found himself at the center of the action a couple minutes later, stealing an pass from sophomore guard Paul Scruggs and taking it all the way for a dunk which made it 19-11. 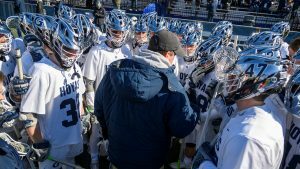 The Musketeers maintained a healthy lead, but the Hoyas began to find their groove on the offensive end. With six minutes to go in the first half, freshman guard Mac McClung grabbed a rebound off a block by senior center Jessie Govan and ran the fast break to perfection, finding a cutting LeBlanc for a slam dunk which cut the lead to six. 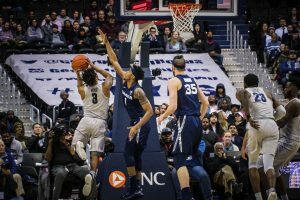 Xavier head coach Travis Steele was particularly impressed with McClung’s play after he missed their first matchup on January 3 due to injury. With eight minutes to go in the first half, the Hoyas went on a 6-0 run, to cut the margin to four, but the Musketeers came right back with a 5-0 stretch of their own. Following a 3-pointer from sophomore guard Paul Scruggs, Govan got inside for an and-one layup and made the free throw to bring the Hoyas within six with a minute to go in the first half. However, just before the buzzer, junior guard Quentin Goodin got a baseline jumper to fall to put his team up, 36-28, going into the break. Coming out of the half, McClung got blocked on a layup attempt, but retrieved the offensive rebound and got it to LeBlanc who converted an and-one to bring Georgetown within five. After the game, LeBlanc, who finished with 17 points, spoke about his offensive activity. The Musketeers quickly replied with a Scruggs 3-pointer, but the Hoyas came right back with a 7-0 run which cut the lead to 39-38, three minutes into the second half. Scruggs responded with another 3-pointer, but seven straight points from Akinjo helped keep it a one-possession game. In the postgame press conference, head coach Patrick Ewing commented on how Akinjo was able to recover after going scoreless with no assists in the first half. With 12 minutes remaining, Akinjo hit back-to-back threes, with a 3-pointer from Xavier graduate student forward Ryan Welage sandwiched in between them, to again cut the Musketeers’ advantage to one. After a three from Goodin, junior guard Jagan Mosely hit a 3-pointer from the corner off an assist from senior guard Greg Malinowski, and on the following play Malinowski fought for an offensive rebound and found LeBlanc inside for a layup to give Georgetown its first lead of the game. The next offensive possession, LeBlanc played the role of distributor, finding Mosely again sitting in the corner for a 3-pointer and the momentum had swung fully in favor of the hosts. Ewing was pleased to see his veteran guard step up. The Hoyas held on to their slim lead for a few minutes until Goodin hit his third 3-pointer of the night to put his team back up two at the five-minute mark. Akinjo came right back, though, with a three of his own to give Georgetown a lead they would not surrender. With a minute remaining and the Hoyas up three, Akinjo burned some clock and then pulled up for a three. He missed, but sophomore guard/forward Jamorko Pickett, was right there for a putback layup, his only points of the night. On the next play, Akinjo grabbed his fifth steal of the game on an errant pass from Scruggs to all but seal the win. The Hoyas made their free throws down the stretch and came out with a huge comeback victory. They now sit at third in the conference behind Villanova (17-4, 8-0 Big East), who they face on Sunday, and Marquette (19-3, 8-1 Big East). “We have to continue to build and continue to believe in ourselves and believe that at the end, we’re going to be right there in the mix with everyone,” Ewing said. The Hoyas tip off against the Wildcats in Philadelphia, PA at 12:00 p.m. ET on Sunday. 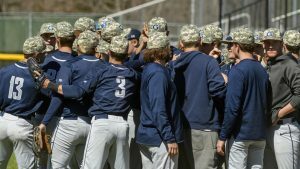 The game will be broadcast on Fox Sports 1 with live stats available at guhoyas.com. 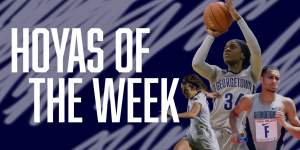 Follow @GUVoiceSports on Twitter for more updates and coverage of all Georgetown sports.